The Israeli military investigation of itself closed Wednesday with the decision to file no charges against the soldiers who massacred 70 Palestinian civilians in a single day on August 1st, 2014. The day, known as ‘Rafah’s Black Friday’, came in the midst of a series of massacres, including the destruction of whole families from great-grandparents to infants, during Israel’s brutal invasion of Gaza. 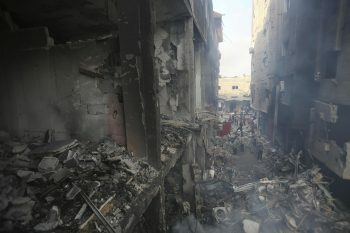 It also came just days after the Shuja’eyya massacre, in which Israeli forces dropped hundreds of tons of bombs all night long on the neighborhood of Shuja’eyya in central Gaza, causing residents to flee from their homes and run screaming down the streets to try to escape the bombs, after hundreds of people were killed. According to the Israeli military investigator, Liron Libman, the military’s self-investigation found no evidence of war crimes, claiming that the investigation was “rigorous”. But Palestinians in Rafah said no witnesses to the crimes were ever interviewed, and the Israeli military made no effort to examine the evidence on the ground. Libman reported that 1,000 artillery shells were fired over the course of four hours in Rafah, in southern Gaza. He gave no explanation for the killing of the seventy Palestinian civilians. In response to the investigation’s findings, the Chief Israeli Military Advocate General Major General Sharon Afek said he would close the case, with no chance of appeal. Afek said that there would also be no reprimand or any consequence at all for any of the officers involved. Israeli authorities claim that this internal investigation will protect them if Palestinians try to bring a case to the International Court of Justice, but some international law experts disagree, saying the Israeli internal investigation of the alleged war crimes was far from thorough. The investigation took four years to complete, leading some Palestinian victims to conclude that the Israeli military was purposely dragging its feet and taking more time than necessary to investigate. Palestinian leaders criticized the findings, and some have vowed to take the case to international criminal court.